Design of the Bf 109 was initiated by Bayerische Flugzeugwerke in late 1933, following issue by the Reichsluftfahrtministerium (RLM) of a specification for a monoplane fighter to replace the Arado Ar 68 and Heinkel He 51 in Luftwaffe service. The need was not then urgent, but the RLM believed that by competitive evaluation and with reasonable time available for development, they would have a worthwhile fighter when the moment came for it to enter operational service. Submissions were made by Arado, Bayerische Flugzeugwerke, Focke-Wulf and Heinkel: those of the second and last companies were selected for construction and evaluation, with each initially to build ten examples. Heinkel's He 112 was the first to fly (in the summer of 1935) but it was the Bf 109 that was to be built in very large numbers. Both of these prototypes made their first flight under the power of a 695 hp Rolls-Royce Kestrel in-line engine, as the Junkers Jumo 210 in-line engine - around which both had been designed- was not available in time. Using the Me 108 airframe as the basis for the design; the wings, undercarriage, rear fuselage and tail of the new Me 109 fighter were the same as in the Me108. The prototype, powered by a Roll-Royce Kestrel, first flew in May 1935, piloted by Haus Knoetzsch. Follow-on prototypes utilized several other engines until settling on the Daimler-Benz inverted-V, liquid-cooled engine that powered subsequent airframes throughout its wartime production. The new fighter’s first public demonstration took place at the 1936 Olympic Games held in Berlin, but the plane’s first real impact on the aviation world came during the international flying meet held in Zurich in the summer of 1937. Five Bf 109s took part and demonstrated outstanding climbing, diving, and maneuverability, along with astonishing speed. While these impressive demonstrations were taking place, twenty-four Messerschmitt fighters were delivered to Spain for the Condor Legion. Bf 109B-2 and variants of the Bf 109C were flown by the Condor Legion in the Spanish Civil War. A single-seat fighter of all-metal construction, the Bf 109 was a cantilever low-wing monoplane, the wing having automatic leading-edge slots, large slotted trailing-edge flaps, and ailerons which drooped when the flaps were right down. The main landing-gear units were retractable but most versions had a non-retractable tailwheel. The tail unit was conventional, but the tailplane was braced by struts until a tailplane of cantilever structure was introduced with the Bf 109F. 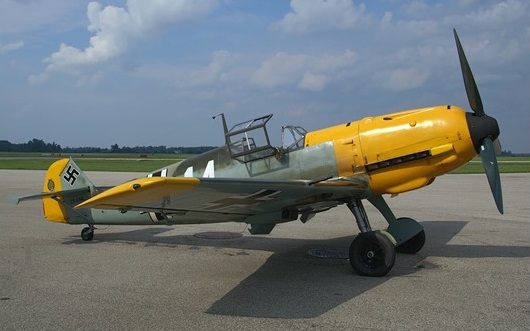 First production version to enter service with the Luftwaffe was the Bf 109B-1 powered by a 635 hp / 473.2kW Jumo 210D engine, followed by the 109B-2 with a 477kW Jumo 210E and later with a 499kW Jumo 210G. Armament of the Bf.109B-1was three machine-guns. The Daimler-Benz DB 600 engine was introduced in the Bf 109D version: more than 200 of these being in service with the Luftwaffe at the outbreak of war. By the time England declared war on Germany, the already-proven Messerschmitt was being mass-produced in the Bf 109E series and was ready to enter the fight. The 109D was followed into service by the Bf 109E with 820kW DB 601A engine. In addition to production for the Luftwaffe, some 300 examples of this type were exported. The Bf 109E was the principal version used in the Battle of Britain and was followed by the Bf 109F with an 894.2kW DB 601N or 969kW DB 601E engine. The Bf 109F had much cleaner aerodynamic lines, introducing the unbraced tailplane and retractable tailwheel. The Spitfire, the Bf 109's first major opponent, was slightly faster and definitely more maneuverable, but its performance at altitude was inferior. There was also little difference in pilot ski between the Luftwaffe and the Royal Air Force, although pilots in the RAF had the advantage of fighting over their own country, while the critical range of the Bf 1 09s limited German fighting time to about twenty minutes. The Bf 109E-3 which formed the standard equipment of Luftwaffe squadrons in the Battle of Britain in 1940 had an 1100 hp Daimler-Benz DB601A engine and was armed with one 20 mm cannon and four machine-guns. Also licence built by Fiesler. The Bf 109G or Gustav was first flown as a type in 1944, with the G-10 having an enlarged supercharger to enable it to be used as a high altitude fighter in defence of the Reich. With a service ceiling of 41,000 feet, the Gustav G-10 was also the fastest of the series with 426 mph at 24,000 feet. Armament was one 30mm cannon and two 13mm machine guns, all in the nose. Modified around the 1475 hp DB605 engine, the Gustav also introduced cockpit pressurisation, crucial from late 1942 onwards as the fighter Gruppen struggled to repel high altitude USAAF daylight bomber raids. The Bf109 was the most abundantly produced fighter manufac-tured by either side in the 1939-45 war. When German production stopped, the G series of the Bf 109 was produced in far greater numbers than any other model, 21,000 being completed by the end of 1944. This machine had two MG 131 machine guns, a single 30-mm MK 108 cannon firing through the spinner, and sometimes carried two underwing MG 151/20 weapons. Postwar Spain continued licence manufacture of the Gustav as the Merlin engined Hispano 1112M Buchon. A significant quantity of Bf 109G-1s and -G2s were assembled by IAR at Brasov from main parts supplied by the Germans. These fighters received white serial numbers on their fin in the 'White' 200 series. The next sub-version assembled at IAR was the Ga-4, a total of 15 being finished up to the factory being dispersed in the summer of 1944 due to Allied bombings. The first one was rolled out in April 1944. 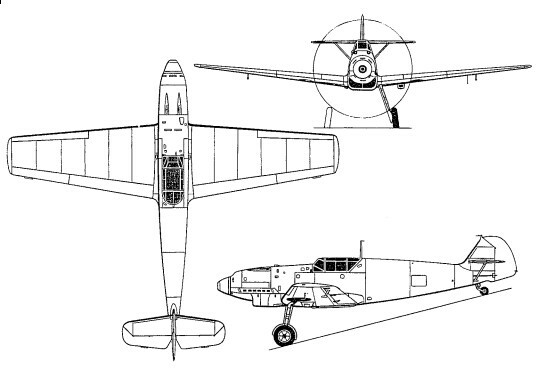 The Ga-6 was the next sub-version to be manufactured at IAR--Brasov. The first one, 'Black' 316, was test flown only in early February 1945. Nevertheless, none of the IAR-manufactured Bf 109Ga-6s saw action during World War Two. The mainstay of the Luftwaffe’s fighter arm, over 30,000 were built of the Gustav variant alone between 1941 and 1945. It has been estimated that about 35,000 Bf/Me 109 were built between 1937 and 1945. Last versions to see limited use were the increased-span Bf 109H and a refined version of the Bf 109G, designated Bf 109K. 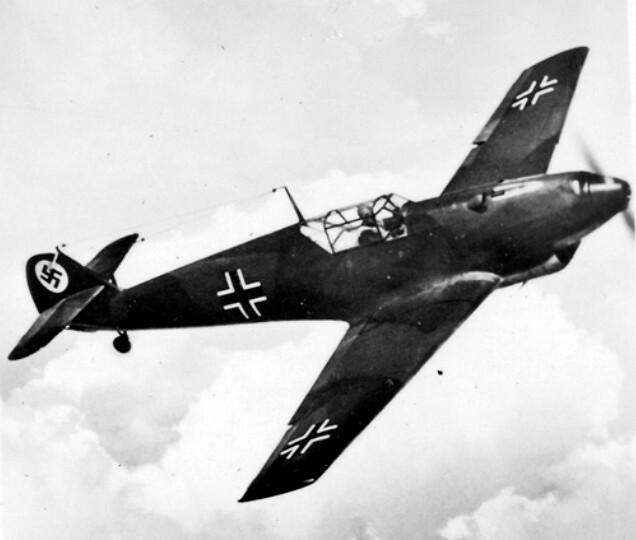 And right at the end of the war final German deliveries amounted to 19 examples of the Bf 109K-4 with more power and armament as well as a pressurised cockpit. 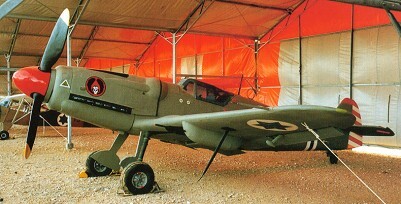 Production of the Bf 109 continued in Czechoslovakia and Spain during early post-war years, and some Czech-built S-99 were used in a training role until 1957. Nazi Germany saw the Spanish Civil War as an ideal conflict in which to test its renascent forces and their new weapons, and therefore supported the ideologically allied Nationalists with small but high-quality forces. The air component was the Legion Condor, which began to arrive in November 1936 and included as its fighter element Jagdgruppe 88, initially comprising three Staffeln with He 518 biplanes. In January 1937 three Bf 109B prototypes were trialled in Spain, their success prompting the despatch from March 1937 of the first 24 of an eventual 45 Bf 109B-2s for service with 1. and 2.J/88 as well as the Nationalists’ 5-G-5. This immature fighter proved generally superior to all its opponents, and Bf 109s notched up J/88’s 100th ‘kill’ in January 1938, more than tripling this score by the time the Germans pulled out of the war in March 1939 after gaining invaluable tactical experience. In the mid-war years, Germany bolstered the Italian air force with numbers of fairly advanced fighters. The initial deliveries comprised sufficient Bf 109F fighter-bombers (in F-4/B and F-4/R1 variants). Further reinforcement was necessary in 1944: the Italians thus received the upengined and upgunned Bf 109G model in the form of 28 G-6, 97 G-10 and four G-12 variants. As a bomber interceptor the Bf 109G-6 was armed with two MG 131 machine guns, a single MK 108 30-mm. cannon firing through the propeller shaft and two MG 151/20 under-wing guns. In 1943 Hispano received a contract to build the Messerschmitt Bf 109G under license for the Spanish Air Force. Designated Hispano HA-1109, it was powered initially by a Hispano-Suiza HS-12Z engine and later, in HA-1109/1110 Buchon variants, by the Rolls-Royce Merlin. CASA of Spain built the RR Merlin powered Messerchmitt 109 as the HA1112. In Czechoslovakia, Avia produced the Messerschmitt 109 as the Avia S-199 Mezek. Engine: 635 hp Jumo 210D. Armament: 3 x machine guns. Engine Daimler Benz DB 601A, 1,100 h.p. Max speed: 387 mph (623 km/h) at 23,000 ft (7,000 m). Armament: two MG 131 mg, one MK 108 30 mm. cannon firing through the propeller shaft and two MG 151/20 under wing guns. Max speed: 452 mph at 19,685ft.